14 Şubat 2019 Perşembe 14:01 - 4 reads. The new electric scooters are a great danger to pedestrians and should not be allowed, as planned, on the sidewalk. To Siegfried Brockmann, head of accident research of the insurers (UdV) in the Interview. Mr Brockmann, from the spring of electric micro-vehicles are to be authorised in Germany. Where should the go? The road would be for the user of this Mobile, in fact, too risky. They are relatively slow, it is expected of you, you have an unusual Silhouette. The Plan is to bring you, in principle, on bike paths, is therefore, from my point of view understandable. Also, the maximum speed of 20 on the bike paths relatively unproblematic. The Problem starts where I give walkways. According to the proposed regulation to go by the additional plate. And one must assume that the large-scale is applied. The Association of foot e. V. fears of a "dam break" for vehicles on the sidewalk. Yes, the dam burst, I also see and believe it to be problematic. A footpath is for pedestrians. When the softening is the protection for the pedestrian on his space on the road in danger. the walkway Is through the E-scooter so insidiously the driving surface? that depends on how successful the scooters are on the market. I could imagine that they are quite successful. Then we will see you regularly on the sidewalk, whether this is allowed or not. This is very clear to me. 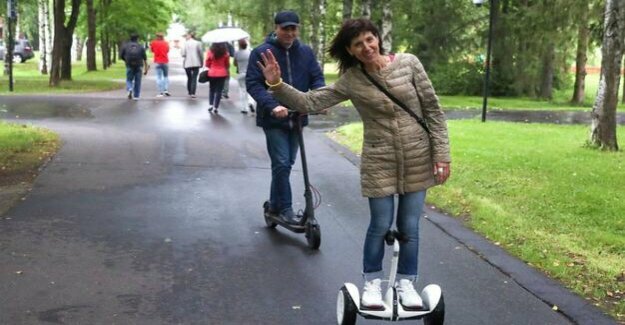 The Bicycle Association ADFC and foot, e. V. warn of mass accidents caused by E-scooter. You expect? That depends on the distribution. The higher the numbers, the higher the accident numbers. The question is whether the accidents are proportionately or disproportionately to the spread. And secondly, who is injured. Even if the number of accidents is proportional to the spread are, but most pedestrians are injured, is not acceptable. See the pedestrian at risk? Yes. The chances are that the drivers take pedestrians into consideration are more likely to be low, as in the case of cyclists. How it can be determined whether there is a disproportionately high number of accidents? so Far, not at all. The official police statistics is not familiar with these devices, no policeman can check the on his traffic accident report. That is why we have requested that these sheets be quickly adjusted. Otherwise, these accidents will not be documented. Federal transport Minister Andreas Scheuer (CSU), is also planning a Ministerial permit for E-vehicles without steering, such as hover boards, Electric skateboards, or a One-Wheeler on sidewalks. In the case of these devices, I'm even more critical and is of the opinion that they should not be allow at all. You don't need to do anything just because electric. In the case of the large E-scooters I see because of the so-called last mile is still a Benefit to society. In the case of hover boards and One can't detect Wheelern I the. These are dangerous toys. The user has no steering and have to balance the device itself, so he can brake much harder to Dodge, and on the environment. This is a big risk. The plans provide for a maximum speed of 11 km/h for the walkway Boards. Can there be serious accidents? When it comes to this: of Course! One-Wheeler, and E-Skateboards are very solid, and 11 km/h would be no Peanuts. A Jogger jogs with 7 to 8 km/h, 11 km/h you need to race. You race right times against a disk, then you have the kinetic energy of such an accident. And with this speed you to rest on children, Old, Weak and Blind. That's why I can't see at all why it should be legalize. For us, there is in the policy, the two magic words. The "Digital" and "electric drive". Ensure that you should all find it first. I'm not completely against it, but we need to see where we draw the limits. For the walkway Boards, there should be a two-year test phase. How to evaluate this Test? I would say That it is difficult. That would be only if you would be limited to a territory, a police Bureau. There, the police would be stopped then, accidents in the trial period by special message. A Federal Test would only make sense if all the police forces of the Laender aware of that and explicitly any accident with such a device would report. I can't imagine. I know currently, not a single scientific study in the world. pedestrians Need to be extra careful on the sidewalk? no. Except for the mutual consideration no special duties of Care to meet him. The E-vehicles need to take the pedestrian into consideration. And who pays, if there is an accident? When a pedestrian is approached, the insurance pays for the E-rider. For the E-scooter is a motor Vehicle liability insurance is, after all, and an insurance plate. So, at least, is taken care of for accident victims. What is in the case of an accident, with a One-Wheeler or Hoverboard? Also, mainly because pedestrians and cyclists can be severely injured. Since the vehicles would be private liability, however, is not. you call for insurance plaques for all E-vehicles? This seems to me to be for the protection of victims is very useful. It would also increase without insurance the risk of the accident flight. If I had to pay for the damage, I'm significantly more likely to be from the dust, as if I'm insured. you Can't make it for the send E-scooter as an exception? no. The legislature has thought many years ago something to the motor Vehicle compulsory insurance law: Car can cause significant damage, and may not remain on the Damaged slopes. Also, Hoverboards are motor vehicles, so also, you must have Automobile liability insurance. The manufacturers see it differently. May be, but from my point of view is indisputable: Everything moves about 6 km/h and not muscle is operated, a motor Vehicle. The Vienna Convention on road traffic, the Federal Republic has subjected to. In addition, we have set ourselves the Pedelecs, but at least one must occur. The scooter manufacturers indicate that it is dealing with E-vehicles to many other countries, lax handled. That's right. And the fact that these vehicles with speed and Power, are pushing into the market, the device of the Minister of transport, in addition to under pressure. But we need a sensible regulation. Ideally harmonised, but I don't see that in the short term. How to see the, in your opinion? As I said: E-vehicles should drive on the bike path and, without exception, a motor Vehicle liability. On the sidewalk, you have nothing to look for. If we can't prevent it but you will need to select at least one pedestrian compatible maximum speed. For pedestrian areas should be, in my view, a maximum of 6 km/h.